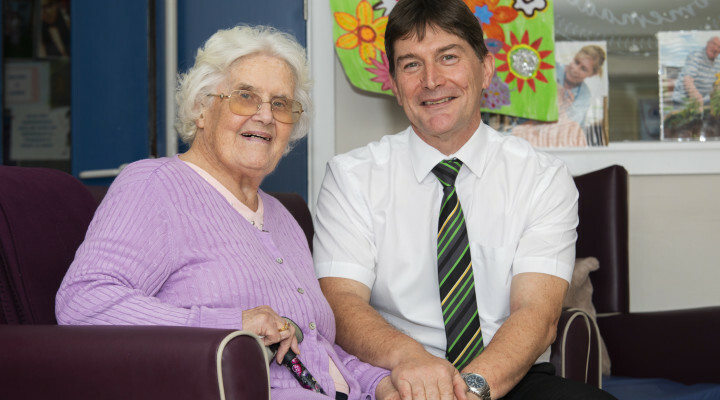 A care home manager who held senior roles in the NHS for 27 years before moving into social care with ambitions of “making a difference” is in line for a top industry award. Registered nurse Geraint Morgan general manager of Hafod’s Ty Penrhos Care Home in Castlegate, Caerphilly says he gets as much satisfaction mentoring his staff and encouraging them to value themselves as he does from securing high standards of care for his elderly residents. All the hard work has now paid off with a place in the final of one of Wales most prestigious industry events – the Wales Care Awards 2018. Now in their 15th year, the national awards are organised by care industry champions Care Forum Wales which is also toasting 25 years’ of service this year. They acknowledge the hard work and exceptional performances of those in the care sector. The grandfather-of-three, who lives in Newport with wife Susan has beaten tough competition to be shortlisted for the Excellence in Leadership and Management category. Geraint will now attend a glittering awards ceremony at City Hall in Cardiff on Friday, October 19 where the winners will be announced. “I’m absolutely amazed,” he said. “The staff will tell you I’m always pushing them forward for these awards, it’s really strange to have the tables turned! Geraint, who has three grown-up children and three grandchildren, grew up in Aberdare and attended Aberdare Boys Grammar School. He completed his nursing training at the Royal Gwent Hospital in Newport followed by a degree in nursing and a Masters at the University of Wales College of Medicine. His last NHS role was helping to establish local health boards in Caerphilly before he took on a secondment with the Care and Social Services Inspectorate for Wales. After this, Geraint moved into the independent sector and took on a variety of senior management roles at care homes. Geraint said “It was definitely the right career for me. What I love doing is encouraging and coaching staff to make a difference to people’s lives. “If you were to ask my team what I say at the end of our daily meeting they will tell you ‘let’s make somebody’s life better today’. That’s what it’s all about”. “It’s a very rewarding job. I’ve thoroughly enjoyed the last two years at Ty Penrhos Care Home and am very proud that it’s now considered one of the best in the area. Nominating Geraint for his award, Karen Heard, clinical nurse manager, described him as a “role model” to staff. This entry was posted in Community, Health, News. Bookmark the permalink.